Total world military expenditure rose to $1686 billion in 2016, an increase of 0.4 per cent in real terms from 2015, according to new data released by SIPRI on Monday. SIPRI is proud to announce a new interactive webpage showing military spending data through maps and interactive graphics. The interactive guide allows users to explore the past 10 years of countries' military spending and read about related issues. SIPRI Senior Researcher Hugh Griffiths contributed to the UN Panel of Experts monitoring sanctions on North Korea. Griffiths was the lead investigator in several aviation, arms, designated entry, insurance and sanctions evasion cases for 2016. SIPRI’s partner organization in Mali, CONASCIPAL (National Coalition of Civil Society for Peace and the Fight Against the Proliferation of Light Weapons), has produced a video to show the status of its peacebuilding work in Mali. SIPRI is pleased to announce the launch of the new short-film series Peace Points featuring SIPRI Director Dan Smith. Each video will provide analysis on timely issues, going beyond the news headlines, in the field of peace and security. China's ambitious Silk Road Economic Belt project aims to provide critical infrastructure across Eurasia. How does this interact with security dynamics in Central and South Asian states? Since the formation of the National Unity Government in 2014, Afghanistan's President and Chief Executive Officer have failed to achieve stability in the country. Until the Afghan political elite start to work together, the opportunity for effective government will be wasted. Ahead of the 2017 Stockholm Forum on Peace and Development, SIPRI is pleased to present blog posts from partner organizations, highlighting successful and sustainable peacebuilding initiatives. SIPRI and the Swedish Ministry for Foreign Affairs are proud to host the 2017 Stockholm Forum on Peace and Development. With the theme of ‘Sustaining Peace: What Works?’, the 2017 Stockholm Forum will identify good practice in peacebuilding interventions and assess how and under what conditions such approaches might be replicated, scaled or modified to meet the needs of other contexts. 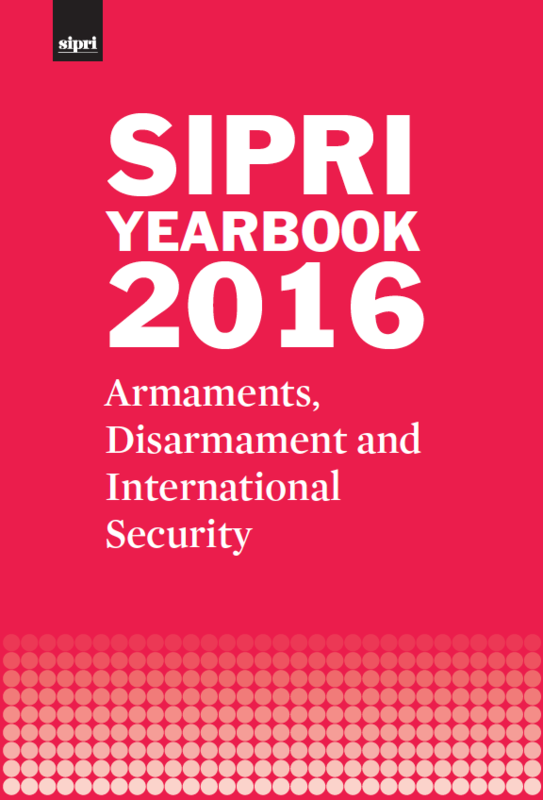 Please contact SthlmForum@sipri.org with any enquiries. SIPRI's Head of Peace Operations and Conflict Management Programme, Dr Jair van der Lijn, presented the findings of the report African Directions: Towards an Equitable Partnership in Peace Operations at a panel event in New York. The event was co-organized by the Permanent Missions of Ethiopia, Finland and the Netherlands and the Friedrich-Ebert-Stiftung (FES). It aimed to strengthen the global–regional partnership between Africa and the UN. SIPRI Researcher Ekaterina Klimenko participated in a panel discussion on the upcoming Finnish Arctic Council chairmanship. Finland assumed the chairmanship of the Arctic Council in April in an increasingly uncertain political environment and the discussion explored what this could mean for the Arctic region. The discussion took place at the Finnish Institute of International Affairs. SIPRI is pleased to welcome Jan Eliasson as the new Chair of its Governing Board. Eliasson previously served as Deputy Secretary-General of the United Nations from July 2012 to December 2016. He takes over the role of Chair of SIPRI's Governing Board from Ambassador Sven Olof-Petersson. World military expenditure is estimated to have been $1686 billion in 2016, equivalent to 2.2 per cent of the global gross domestic product (GDP) or $227 per person. The 2016 estimate is a marginal increase of about 0.4 per cent in real terms on 2015. From 24 April 2017 the SIPRI Military Expenditure Database includes newly released information on military expenditure in 2016. 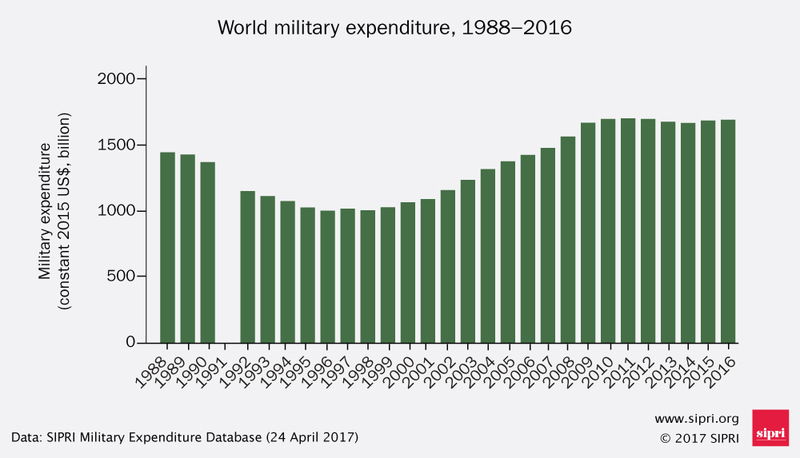 This Fact Sheet describes the global, regional and national trends in military expenditure that are revealed by the new data. The annexation of the Crimean Peninsula by Russia and the onset of armed conflict in eastern Ukraine are often attributed with fostering a new security dynamic in Europe and Asia. This report contains case studies on China and Russia in both non-traditional and traditional security domains from 27 experts from 13 countries. This report explores how regional actors view the impact of Chinese and Russian activities on their strategic domains in North East Asia, South East Asia, South Asia, Central Asia and Europe. Iran’s ballistic missile programme has long been a source of tension in Iran’s immediate neighbourhood and beyond. Continued implementation of the recent Iranian nuclear agreement is inextricably linked to Iran’s programme, ensuring that, at least for its duration, Iran does not develop a nuclear warhead to mount on top of a missile. Controlling Iran’s access to sensitive goods will also remain important, but Iran’s progress to date has demonstrated the limits to what export controls alone can achieve. As a result, other approaches, though rife with difficulty, merit some exploration.